Our back catalogue of dinosaur inspired videos, model making tips and advice, reviews of models etc. How Big is the PNSO Ceratosaurus Dinosaur Model “Nick”? How Big is the PNSO Ceratosaurus Dinosaur Model? The new for 2019 PNSO Ceratosaurus dinosaur model “Nick” is certainly making waves amongst dinosaur fans and model collectors. Staff at Everything Dinosaur are not sure why our chums at PNSO chose to call their Ceratosaurus figure “Nick”, but all of us have been very impressed with the quality and craftsmanship demonstrated in this exceptionally large dinosaur model. How big is the PNSO Ceratosaurus? We could get out one of our tape measures or geological rulers to show just how huge this model is, but, instead we have created a short video that compares the PNSO Ceratosaurus with the recently introduced CollectA Deluxe Ceratosaurus. After all, a picture (or in this case a short video), is worth more than a thousand words, or so the saying goes. In this short video (it lasts a little over thirty seconds), we compare the PNSO Ceratosaurus dinosaur model with the CollectA Deluxe 1:40 scale Ceratosaurus, which itself is a sizeable dinosaur replica. The CollectA Deluxe Ceratosaurus is a recently introduced model, it only came out last year. However, the CollectA figure is dwarfed by the impressive and enormous PNSO Ceratosaurus. The PNSO replica is one of the largest Theropod figures that we have ever stocked. The PNSO Ceratosaurus dinosaur model “Nick”. CollectA Ceratosaurus – length 27 cm approximately with a head height of 12 cm. PNSO Ceratosaurus “Nick” – length around 58 cm approximately, with a head height of about 26 cm. Remarkably, the base for the PNSO figure is around ten times the size of the base associated with the CollectA Deluxe Ceratosaurus. A number of species have been assigned to the Ceratosaurus genus and it is difficult to decide which species these replicas represent. For example, do they represent C. nasicornis or perhaps C. dentisulcatus? Whatever the species epithet, both these models are most impressive, but the PNSO Ceratosaurus is going to need a lot more shelf space. In terms of calculating a scale for the PNSO model, this is challenging. The maximum size for Ceratosaurus is unknown with estimated lengths ranging from about 4.5 metres to excess of 6 metres depending on the fossil specimen and the species. If we take the upper figure (six metres) and we estimate the length of the PNSO Ceratosaurus to be about sixty centimetres, then, based on this crude assessment, the PNSO figure is in approximately 1:10 scale. Comparing the PNSO Ceratosaurus dinosaur model with the CollectA Deluxe Ceratosaurus. Many of the people that Everything Dinosaur team members follow on social media are fossil hunters. We have noticed that today, Thursday, seems to feature a lot of our fossil hunting friends showcasing their finds using the meme “fossil flip Thursday”, some of our fossils are a little too delicate to flip, but we thought we could give it a try and highlight the excellent packaging of the PNSO Age of Dinosaurs small models. We made a short video – Pterosaur toss – featuring the new for 2019 PNSO Nemicolopterus figure. In this very brief video, (it lasts just over thirty seconds), we show the wonderful new PNSO product packaging. Each of the new for 2019 PNSO figures has been presented in a blister pack which contains a backdrop reflecting the habitat of that animal. For example, “Ricky” the Keichousaurus, a model of a Triassic marine reptile, has a seascape backdrop, whilst the pterosaur model Nemicolopterus has a forest background. After all, this little flying reptile lived in an arboreal environment. The packaging associated with the PNSO Nemicolopterus model. We even took advantage of the warm weather to photograph this little pterosaur against some foliage – our very own forest backdrop. Known from only one specimen, this may not be a valid genus (nomen dubium), the fossil could represent a very young Sinopterus, a tapejarid that was scientifically described in 2003. The skull for example, is around 4 cm in length, it is one of the smallest pterosaur fossils known to science. Intriguingly, the PNSO Nemicolopterus replica is not much smaller than the fossil specimen. This little flying reptile, whether a Nemicolopterus or a Sinopterus could have comfortably sat in the palm of your hand. A scale drawing of the tiny pterosaur named Nemicolopterus. The validity of this genus has been challenged. It might not be valid, (nomen dubium), it is possible that the single specimen so far described represents a related tapejarid (Sinopterus). The PNSO Age of Dinosaurs (Toys that Accompany your Growth) range features a total of forty-eight small models. This is a diverse and varied range, for instance, several horned dinosaurs feature – Kosmoceratops, Einiosaurus, Liaoceratops, Xenoceratops, Pachyrhinosaurus and Chasmosaurus. Many of the replicas and figures represent prehistoric animals that are unique to China, creatures such as the armoured dinosaur Tuojiangosaurus, the bizarre marine reptile Atopodentatus and the troodontid Mei long. However, other models represent prehistoric animals that have no connection with China, or even Asia for that matter. 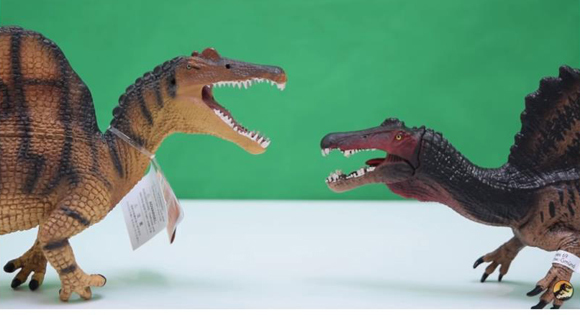 For example, the ferocious marine crocodile Dakosaurus or the Baryonyx dinosaur model. A few days ago, JurassicCollectables posted up onto their excellent YouTube channel an unboxing video featuring a trio of Tyrannosaur models that we, at Everything Dinosaur had sent them. The narrator could hardly contain his excitement as he opened the box and unwrapped the three colour variants of the Kaiyodo Sofubi Toy Box T. rex. In that short, unboxing video we were promised that each model would be reviewed at length in the near future. True to their word JurassicCollectables have posted up a video review of the Kaiyodo Sofubi Toy Box Tyrannosaurus rex “classic colouration”. In this video review (it lasts for a little over twelve minutes), the narrator discusses the packaging (this model comes in a special edition box) and points out the degree of movement afforded by the ten points of articulation. This Tyrannosaur is known as the “classic”, as the colour scheme chosen for this figure was inspired by the highly influential Czech painter and illustrator Zdeněk Burian. The Kaiyodo Sofubi Toy Box T. rex can be put into a variety of poses. The recently reviewed Eofauna Scientific Research Giganotosaurus (G. carolinii), makes an appearance and helps to provide a size comparison with the Kaiyodo figure. In addition, JurassicCollectables uses a Papo green standing T. rex model to help to give an impression of the figure’s size. Naturally, off-colour Alan gets involved too and the narrator comments that when the Kaiyodo Sofubi Toy Box T. rex is placed next to the Alan Grant action figure, it looks like a juvenile T. rex. This is highly appropriate as a juvenile Tyrannosaurus rex is referenced in the original Jurassic Park novel by Michael Crichton. The narrator comments upon the beautiful background image provided in the special presentation box and reflects on the skilful craftmanship and the care taken to produce the stunning paint scheme and the graceful airbrushing. The mouth and jaws (the figure has an articulated upper jaw), are singled out for special praise. The Kaiyodo Sofubi Toy Box T. rex meets “off-colour Alan”. A close-up view of the head of the Kaiyodo Sofubi Toy Box T. rex “classic” colouration. Aimed at collectors and not for dinosaur fans under fifteen years of age, this limited edition and quite rare dinosaur model is available from Everything Dinosaur (whilst stocks last). The talented team at JurassicCollectables got a surprise this week. A large box was delivered to them, it came from us at Everything Dinosaur, but what did it contain? The narrator could hardly contain his excitement as he carefully cut through the securing tape and examined the contents. Inside, were all three of the rare, limited edition Kaiyodo Sofubi Toy Box T. rex dinosaur figures. A trio of Tyrannosaurus rex models from Japan for JurassicCollectables to review. In this short video (it lasts just under three minutes), the narrator discovers all three of the Kaiyodo Sofubi Toy Box T. rex figures. First out of the box is the yellow and black colour variant of this articulated dinosaur model series (SOFUBITOYBOX018A TYRANNOSAURUS REX). The next dinosaur to feature is the “smoke green” colour variant from Kaiyodo (SOFUBITOYBOX018B TYRANNOSAURUS REX) and last but not least, the narrator reveals that the parcel also contained the beautiful “classic” colour variant which comes in its own presentation pack. The narrator comments that he had to find a new place to shoot the video, as the box was so large, the three models are surprisingly big, they each measure around twenty-seven centimetres long. The Kaiyodo Sofubi Toy Box T. rex figures. All three models were made to highlight the capabilities of the design team at Kaiyodo, when it comes to constructing articulated prehistoric animal figures. Each model has a total of ten points of articulation, as far as we at Everything Dinosaur know, this is the largest amount of articulation in any T. rex collectable figure which stands under thirty centimetres high. The neck, the upper jaw, forelimbs and both ankles are articulated. In addition, there are two points of articulation associated with the tail. Two of the Kaiyodo Sofubi Toy Box T. rex dinosaur models together. Each model has ten points of articulation so that they can be put in different poses. The concept behind the design of these limited edition figures, is quite simple. Kaiyodo wanted to produce a single dinosaur model that permitted the collector to place the T. rex in all its poses that have been proposed for how this dinosaur stood since it was formally named and scientifically described back in 1905. This was quite a challenge, however, each model can be put into the traditional “kangaroo stance”, with the tail resting on the ground. It can also be posed in numerous other configurations, representing more modern approaches to the stance of this hypercarnivore from the Late Cretaceous of North America. The Kaiyodo Sofubi Toy Box “smoke green” T. rex dinosaur model. When first produced, these three figures were part of a limited production run and all colour versions are now all out of production (we think). These Japanese models are certainly very rare and not widely available. The Kaiyodo Sofubi articulated Tyrannosaurus rex figures are for collectors, they are classified as “collectable prehistoric animal figures”, as such they have a 15 years and above age classification. These are articulated dinosaur models that have an age rating! The “classic” Kaiyodo Sofubi Toy Box Tyrannosaurus rex figure. We look forward to watching the model reviews from JurassicCollectables. To see the huge range of prehistoric animal model reviews made by JurassicCollectables, check out their amazing YouTube channel, don’t forget to subscribe! Catch: JurassicCollectables on YouTube. The beautifully sculpted and skilfully painted CollectA rearing Diplodocus dinosaur model helps us to demonstrate a concept called niche partitioning. The term niche partitioning is used by ecologists to explain how organisms use the resources in an environment differently to avoid competition and therefore, by doing this, they can all co-exist. Diplodocus is known to have co-existed with several other long-necked dinosaurs in the Late Jurassic, but they were able to share the same environment as they very probably fed on different types of vegetation. They were probably not directly competing with each other for resources. The CollectA rearing Diplodocus can be posed in a rearing position, as if it is reaching high into the upper canopy of a forest in order to reach the leaves and branches at the very top of the trees that other dinosaurs could not reach. We created a short video (45 seconds), that demonstrates how the CollectA Diplodocus can be balanced to demonstrate niche partitioning. When Everything Dinosaur team members visit schools, we explain this concept using dinosaurs as an example and then challenge the class to think of examples of niche partitioning within modern ecosystems. This helps reinforce understanding about food chains/food webs and how ecosystems are constructed. It also helps to demonstrate an important principle in palaeontology, the idea that we use comparisons from living creatures and environments today to help us understand life in the ancient past. A rearing Sauropod. As well as reaching food, the ability to rear could have had a secondary function as a defensive response to an attack from a predator. Many types of extant herbivorous animal, normally quadrupedal, are able to rear up onto their hind legs in order to reach food that otherwise they would not be able to access. As an extension to this exercise in schools, we ask the pupils to construct food webs to reflect how the chosen ecosystem functions. A South African antelope a Gerenuk rears up to reach foliage. Our team members have posted up numerous articles exploring this topic area on this blog. An examination of why the Cretaceous of northern Africa seems to have had large numbers of super-sized predators: Why so Many Large Predators in Cretaceous Africa? CollectA have included several Sauropod figures within their “Prehistoric Life” model range. The CollectA rearing Diplodocus model is one of the larger figures within this not-to-scale range, with a rearing height of approximately 23 centimetres. The CollectA rearing Diplodocus dinosaur model. The new for 2019 Papo brown running T. rex dinosaur model is now in stock at Everything Dinosaur. This is the first of the 2019 prehistoric animal figures to be released by the French model and figure manufacturer. It will be replacing the Papo running Tyrannosaurus rex (colour variant), which has now been retired, as announced in our blog post dated 15th December, 2018. The figure is based on the same mould as the green running T. rex dinosaur model, but the colour scheme is different. The new for 2019 Papo brown running T. rex dinosaur model. The green running T. rex figure was introduced into the “Les Dinosaures” range back in 2012 and Papo did make a limited edition brown running T. rex subsequently, but this was only in production for a few months. Now the brown version of this popular figure has been included in the company’s catalogue and this figure will be more widely available. The green (background) and the brown (foreground) running T. rex figures from Papo. This new dinosaur model has an articulated lower jaw and it measures more than thirty centimetres long. The head stands an impressive thirteen centimetres off the ground. Everything Dinosaur team members have produced a short video (around 45 seconds duration), to give our blog post readers an opportunity to get a better look at this exciting new model, the first of two tyrannosaurid replicas coming from Papo this year. A Gorgosaurus model is due to be introduced in the summer. The business end of the new for 2019 Papo brown running T. rex figure. A closer view of the articulated lower jaw of the new for 2019 Papo brown running T. rex dinosaur model.